My parents arrived in Bombay, India, in early 1950 by ship. I was less than a year old and my brother Gordy, 18 months older. India was three years independent by then. During the next 18 years we lived in two different locations in North India, and had two furloughs back in the USA—in 1955-56 and 1962-63. 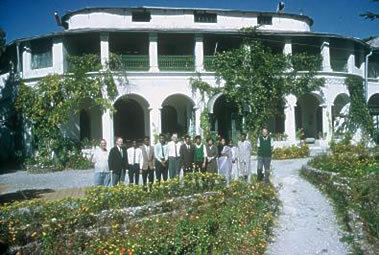 Their last term was 1964 – 68 and although they did not return to India, they stayed with the mission another 15 years. Dad and Mom served with TEAM, which stands for The Evangelical Alliance Mission. This was a “faith” mission which meant they did not get a salary, but were dependent on the faithful giving of friends and churches. “Faith” was a pretty good description of the process. Dharchula, on the west bank of the Kali Ganga River. Nepal on the other bank and a pass into Tibet just to the north. 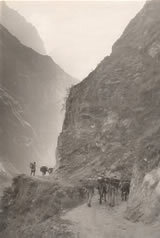 The “road” to Dharchula, took 7-10 days to walk or ride on horseback. Most of the loads, food, fuel, personal belongings were carried on the backs of sturdy coolies (porters). The first mission station my folks were assigned to was in the small village of Dharchula on the west side of the Kali Ganga, the river that divides Western Nepal from India. The village is located on the border of Tibet and one of the major trails leading into (and out of) Tibet passed right by us. To get to Dharchula we would go by train to Kathgodam, the railhead at the base of the foothills. We would catch a bus to Almora, passing through Naini Tal, and from there it would take anywhere from 7-10 days walking. 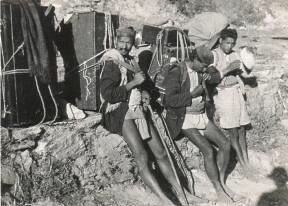 Coolies (porters) were hired, often 40-50 at a time, to carry loads. And Gordy and I, and later Norman and Vernie, would be carried by kundy (a basket on the back of a coolie) or ride a horse, or would walk. There were a few dak bungalows (rest houses), but most of the time it involved camping along the way. It was a somewhat unique area, with a variety of colorful people-groups and languages. One group, the Bhotia, migrated in and out of Tibet each year. They had large flocks of goats which they herded past our home twice a year. Musoorie, view from the library towards Landour. Firland Hall where Dad worked, behind Deodars in Happy Valley, and home of Jiwan Jyoti. The other location was Mussoorie. This small town is located on the first range of the foothills, a hill resort strung along a winding ridge at 6,000 feet, with a panoramic view of the snow covered Himalayas. We lived at the highest point along the east end of this ridge at a location called Landour, which was just under 7,000 feet in altitude. The British were famous for locating comfortable places along the foothills where they could build a cottage and spend the summer. The most famous of these hillstations was Simla, the summer seat of the British government for many years. It, along with Darjeeling (perhaps the second best known hillstation), had a narrow-gauge train that chugged up the slopes to the town. 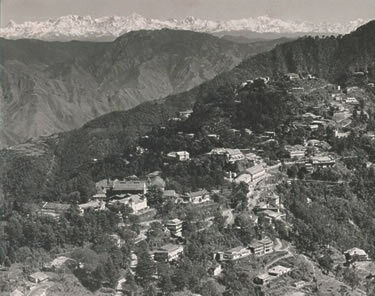 Mussoorie got its start in the 1830s and by the early 1850s had at least one school—Woodstock, the missionary boarding school we attended. This started out as a British girls’ school, but by the turn of the century it had become a missionary boarding school, and American. But since it was thought to have been associated with the British East India Company (but in fact never was), it was (and still is) called “Company School” (except pronounced “kamboni eskul”) by the coolies a hundred and fifty years later. Today there must be a score or more elite boarding schools in our fair hill station. In our day the major schools were: Wynberg-Allen (originally a school for Anglo-Indians), St. George’s (a Catholic run school), Oak Grove (for Railroad employees), and the Tibetan School (which really only came into being after 1959 after a mass exodus of Tibetans from Tibet and the year the Dalai Lama stayed for a time in Mussoorie). There were a couple others like Waverly, and a small American 7th Day Adventist school called Vincent Hill completely on the other end of town, 5 miles away. Landour homes were perched on pretty steep hillsides. Each house had a name. The view of Mussoorie from our home Chenowyth. A view of the bazaar and one of our other homes, Red Burn Oaks, in the foreground. 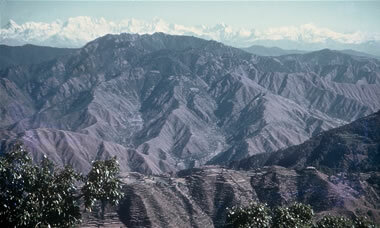 Mussoorie became home after our first furlough in 1956. 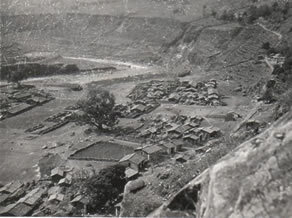 Dharchula became a sensitive area due to its proximity to the border of Tibet, which China was in the process of invading. The government of India was touchy and felt foreigners should not be living in those areas. And so a number of missionaries, mostly from TEAM, but a few from WEC, were asked to move out. This took some time. And since mom was a nurse-anesthetist it was logical that we move to Mussoorie so she could work at the Landour Community Hospital, a mission hospital. Dad started a small ministry called the Landour Bible Institute, which used Bible correspondence courses he wrote to help reach India with the gospel. The name eventually changed to Jiwan Jyoti (Light of Life), and by the time we left India in 1968 something on the order of one million students had taken at least one six-lesson course. 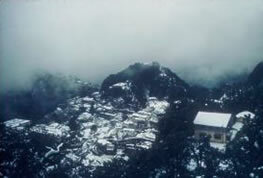 In Mussoorie we lived at the top of the hill in what used to be the cantonment (the military quarter of town). Various missions owned most of the houses in this area, and all the houses had names (mainly because there were no streets, as such, and no street names). We lived at Red Burn Oaks our second term. And at Chenowyth the third. Actually, I kind of like this British tradition of giving houses names. The hillside was heavily wooded with oak trees but on the north side there were a lot of deodar, a type of cedar, and a bit lower down, long needled pine. The bark of this particular type of tree was extremely thick and it was possible to peel it off in chunks, which made excellent material to whittle. The view to the plains below was sweeping, and on a clear day a delight. Dehra Doon(also spelled Dehra Dun) was the major town at the bottom of the hill, 22 miles of switchbacks away, and the closest train station. From here there were really only three directions you could go. To the east was Rishikesh and Hardwar on the Ganges River where it came out of the mountains. To the south was the road through the Siwaliks, a smaller range of hills, to Delhi. And to the west was Rampurmandi and the Jumuna where it came out of the mountains, which, when crossed, would take you up to Chakrata, the hill station between Simla and Mussoorie. 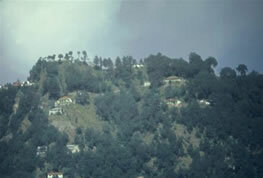 The view to the north from Landour. There were five seasons—spring, summer, monsoon (second week in June to mid-September or so), fall, and winter. All the houses had tin roofs and some of my fondest memories are lying in bed during the monsoons with rain pelting the tin…a din that could last hours. And if it was not raining, the fog would be rolling in each morning, smothering the hillside until it rained or until the sun burned it off in the afternoon. Even on a short walk through this fog we could watch moisture slowly collect on the hair on our arms until they looked furry. Winter started in early December. Because the school had no heat of any kind our “summer vacation” took place during the winter. This worked out well because this was the coolest time to be on the plains. But since we lived in the mountains year around we got the full benefit of a cold winter. Often it snowed, but it usually did not stick long. I can only remember three or four winters out of the 11, or so, where we had snow a couple feet deep that lasted a month or more. But winter was beautiful. The air was clear. You could see out past the Doon to Roorkee and Saharanpur. The Himalayas were always at their best dusted with fresh snow, and late in the afternoon, with the soft magenta of the winterline and the sun gently setting–the colors they cast were a feast for the eyes. Migratory birds came through by the thousands. With all the schools out at the same time the town seemed to slow down. Banias (storeowners) would throw a wrap of Kashmir wool around themselves. To keep warm on real cold days they would take a tin can and put a small wire handle on it, poke some holes at the bottom, fill it with charcoal and light it. They would then wrap themselves with a thin wool shawl, and huddle over this fire, trapping all the warmth. Of course we had to try it. And we found out it took practice and skill not to burn oneself or catch one’s shawl on fire or die of carbon monoxide poisoning. The motor road to Mussoorie from Dehra Doon, best experienced on a motobike or scooter, and good fun coasting down on a bicycle. 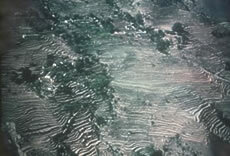 The hillsides were often terraced, and sometimes the fields evidenced centuries of effort. 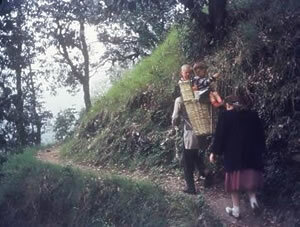 It was often a precarious life – the hillsides were very steep, the yields not great. There was a major motor road coming up from Dehra Doon, which had two score or more hairpin turns in it. It was two lanes, but most drivers drove as if it were only one lane going in whatever direction they were headed. It was 22 miles from Picture Palace, the bus station, to the clock tower in Dehra. A bus could make it in an hour. A taxi in a little less. Or you could walk down the ridge to Rajpur in two hours and catch a bus from there to Dehra for the last nine miles. 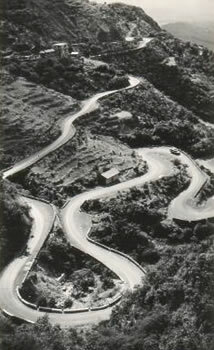 The road that ran along the ridge that Mussoorie straddled was built before the advent of motor cars. They were wide enough for two rickshaws to pass. These don’t look like the ones in the Far East. They are pushed and pulled by 4 coolies and seat two people. Whoever designed these things certainly never pulled one because they were built sturdy…and heavy. As So these roads tended to be fairly steep and narrow. In a couple places roads were fairly level. In fact, we had a level stretch where we lived in Landour. These roads went around the mountain near the top of the hill and were known as “chukkars” (in Hindi it indicates completing a circle, a loop, or to go around). There were three chukkars circling three of the hills on our end of town. These came into play (so to speak) when we began hot-wiring the mission jeep to learn to drive. Heading east on Tehri Road. That’s the ’53 Willy’s Jeep we learned to drive in. And…yes, we ARE riding on the top. And, yes, the drop off is about like what you can see on the far side. Heading east out of Mussoorie was the road to Tehri, 44 miles away (now under water in a great dam scheme). 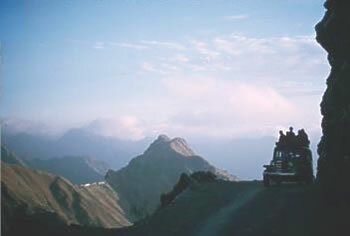 When we first moved to Mussoorie in 1956 this road was really just a wide mule trail. But Uncle Zerne (Dr. Zerne Chapman) took his old US military jeep down that thing farther than anyone had ever gone before and got somewhere near Chumba. It could only have been done with this little jeep and that only when driven by Uncle Zerne. My recollection is that he was the first to do this. Later it was widened and widened some more. It is now a major road, with a macadam surface. From where we lived at the top of the hill to Woodstock was about a mile. However, getting to school was nearly straight down the hill and could be done in about ten minutes. Coming back was different—it took much longer. A footpath always had shortcuts. We knew them all. One of the major footpaths was called the Eyebrow and stretched from Mullingar, at the east end of the Bazaar, all the way to Oakville at the extreme east end of Landour. The eyebrow took a gentle slope upwards over a 20-30 minute walk or so, culminating in a short burst of zigs and zags up a steep slope. So, the hillside was a cross hatch of roads and paths, but mostly just footpaths zigzagging up and down. These rickshaws were heavy and demanded two coolies pulling and two pushing. 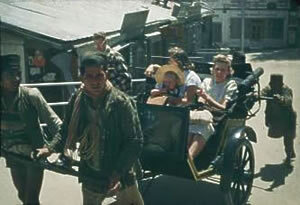 You will now see bicycle rickshaws in Mussoorie, but this type is long gone. Servants were a fact of life. Every house had servant’s quarters. Most of the servants were Paharis from the hills, living away from their family and fields. They cooked (kansamas), watched the kids (ayahs), watched the house (chowkidars), did the gardening (malies), did the sweeping and cleaning (jamidars). I remember when houses did not have flush toilets. What we used was a commode. This little honey pot was duly emptied by the jamidar every day, sometimes several times a day. They were basically emptied into a pit around the corner from the house. Garbage was hauled a little further away, and then dumped down a gully. These gullys were favorite haunts of a variety of vermin and a particular variety of vulture. Before you recoil at how trash was dispensed with, know that anything of value was first pulled out. Magazines were sold, paper collected, tin cans had plenty of uses. What usually got thrown away was not much, and often biodegradable. 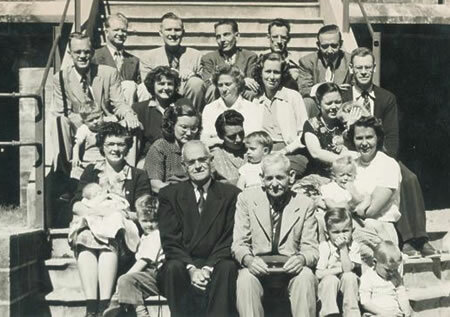 TEAM missionaries of the Tibetan Frontier Field (circa 1951) sitting on the steps in front of Kellog Church. Father Steiner (front row on right) had started off as a Mennonite missionary in Central India before going to Dharchula in 1922. Dad and Mom are in the third row on the left, with me just in front of Dad. An intrepid lot, considering what they did and how far they had to go to do it. Most all houses have flush toilets now and the environmental impact of garbage in the gullys is being addressed. All was not idyllic. Indians kept in their place for generations, stayed in their place out of habit, even though theoretically were free to do what they pleased. The caste system was pervasive, and an accepted part of life. Although done away with by the constitution, it was alive and well but really did not affect us in any way that we could tell. Being outsiders we were outside its grasp and allowances were made for us when we touched things we should not have touched: food, for example. The hillside to the south was almost solid limestone and was being quarried at an alarming rate, leaving huge gashes in the mountainside. A blight to the eyes. It is much less so now since they stopped mining limestone. 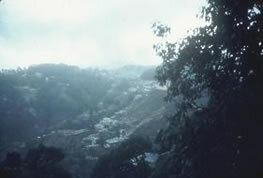 Parts of the area were being denuded and deforested, creating erosion and landslides. But for us life could not have been closer to idyllic. We had good health, we could roam freely in the hills and on the plains, we could read to our hearts content, we could play sports. Transportation was cheap and we traveled widely. It helped to speak the language and have a cast-iron stomach. Hey, life was good! One last thing. You are welcome to send me your comments via email. In fact, I welcome them. (there is a place to do this on the home page). The stories and experiences are factual and truthful to the very best of my recollection. It just so happens that I kept a diary throughout high school, and I still have it. But when writing up my experiences I found I did not need it except once or twice to confirm a date or a name. On occasion I checked with my dad regarding his recollection of events, and in most cases where my story involves someone else, I have allowed them to read what I have written and make suggestions. And a huge thanks to dad for letting me cull through his substantial collection of slides and pictures which I have used to illustrate the stories. Significant thanks needs to be given to several who made this site a reality. Theo Van Rooy, my nephew, helped get me started. Bob Adams, a dear friend in Dallas, continued the good work. And Cynthe Brush (who has Woodstock School beginnings—Class of 1968) did all the graphic design. Marc Mumby transferred all the stories to Word Press and got me up to speed on how to add stories and edit them. Geniuses all four, and to whom I owe a debt I can not repay.